Have a look at Haiku, especially project deadlines for next school year. Continue working on your prototype. Ask questions and get help if you need it. AFTER THE EXAMS each student will create a PROTOTYPE project. already understand well .... maybe a game of some sort. NetBeans is recommended, but BlueJ is certainly adequate. you may wish to review them this summer. class cancellations, that isn't going to fit into this year. the next few class meetings. The class will meet in room 322 during period 2 today. The teacher will distribute a DVD containing the NetBeans Java IDE and various study materials for the summer. We will review the Final Exam results. If you use a personal laptop, bring it to class tomorrow with NetBeans installed. You can either download a copy from https://netbeans.org/downloads/ or install it from the DVD. just demonstrates the layout of the exam. - How does Google search work? Next week we will spend 2 days reviewing for the final exam. If you wish to start reviewing earlier, it's quite easy. like to have explained again. Your project is a much longer process than "just writing a program". specifically how to THINK AHEAD. and start thinking about what kind of a topic you might want to do. Bring questions for discussion during our next class meeting. Investigate and explain the efficiency of various sorting algorithms. 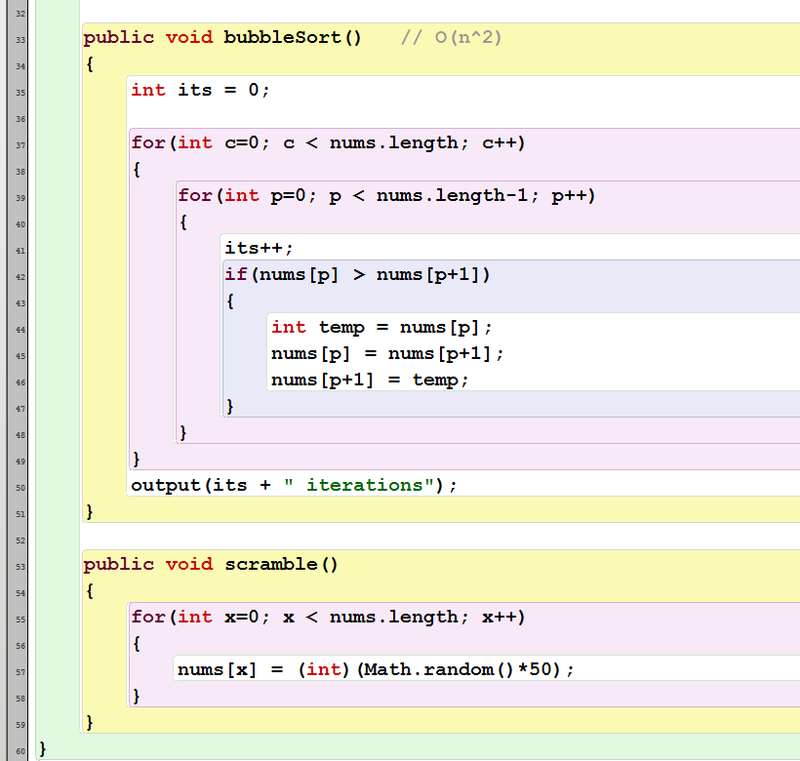 Here is a sample program demonstrating a Bubble Sort. methods for a Selection Sort and an Insertion Sort. Be sure to TEST your methods thoroughly. then start programming a binary search. Today we will discuss how to PROGRAM the dictionary search algorithm. For example, we might have N = 26000 words. searching for a word in the WORDS LIST used in previous programs. Quiz tomorrow about the 3 searching algorithms. This is a very famous Computer Science problem. probably including some simulator programs that "solve" the problem. Homework : Start with the TSP program that you received on paper. add up the total miles in the trip. pieces of program that might be useful in a TSP program. As you read, you should TAKE NOTES about anything that is unclear. Plan on asking questions in class tomorrow. Today we will learn how to INSERT a new word into an Array in alphabetical order. returning the matches as a list (either a Vector or an Array as appropriate). Here is an ALMOST solution to the Extra Spaces problem. It contains exactly one mistake. We must study the problem of searching in lists. Do #1 in an ARRAY. words in a new VECTOR. Do #3 in an ARRAY, returning the matching words in a new ARRAY. CORRECT ALPHABETICAL POSITION in the list. more quickly than a normal SEQUENTIAL SEARCH. #1 - in the WordList program, find the method that does problem #1 above. but it should use an ARRAY to do #2 above. We will do problems #3 and #4 tomorrow in class. On Friday we will do problem #5. Next Monday we will do problem #6. We will have a TEST on Wednesday 24 April, period 1.
so the testing is automated. The Levenshtein Distance between two Strings is based on the minimum number of edits required to change one String into the other. Wikipedia has a straightforward explanation. We will try to write a method that calculates this value. two Strings are almost equal. to implement some search algorithms. (1) write a method for "endsWith()"
"all the words ending with -ology"
Continue investegating : How does Google search work? Read the notes and do some experiments with Google. to work with a partner and help each other. Bring questions for discussion to class on Wednesday. we will base our examples on this list of questions. of the important ideas from our reading in the text-book. The main ideas are summarized in the Ch 10 PowerPoint presentation. Take notes so you can ask questions in the next class. to the whole class on the teacher's computer. We will discuss the reading and experiments about Operating Systems. Read these online notes about operating systems. Bring your TEXT-BOOK to class tomorrow (Friday). user doesn't need to write down results and add it up by hand. still learn something by trying. Also, the notes below may be helpful. An index is a measurement produced by collecting a small set of data for various entities. "I LIKE China better" or "I heard that lots of people are leaving China". we would do a weighted average. which factors should be included and why. but rather to write a computer program to AUTOMATE the production of the results. searching for results, writing down the results and then calculating totals. be included in an index. so you should use BlueJ to run the program (load the "package" file). Then complete the Initial Investigation. Be prepared to discuss your findings on Friday - that means that you should have results for your country, preferably results that are better than any other country. including Worst10 methods - both iterative (SL) and Queue (HL). Read these notes about Information vs Data. Do #1-4 in the practice about PISA scores. and there will be a Quiz on Monday 11 Feb.
How can we delete (remove) data from a Vector? We need a few more BUTTONS and METHODS for our program. Introduction to STACKS (LIFO) and QUEUES (FIFO). We will see how these can be IMPLEMENTED using a VECTOR our BASE CLASS. We need to make our program SAVE the locker data into a FILE on the Hard-Disk. We can use SERIALIZATION to do this. Don't worry about the details just yet. Type the following code into your VectorLockers program and get it running. Be sure that the QUIT button always executes the FINISH method. Here is the Serialization code - add this to VectorLockers.java. and BRING THE WORKING PROGRAM TO CLASS TOMORROW. ALL of the locker assignements. several lockers to a Homeroom Teacher. 4. Create a better [Assign Student] method. A Vector is like a combination of a Linked-List and an Array. Savitch ch 15, p 732-748). The rest is for reference later. and do the practice as described. Quiz tomorrow about this program. Read these notes and do Version 2 of the Lockers program. technical words that sound important. We will discuss them in class tomorrow. of anything that is important to you. Read these notes and do the exercises at the end. Read these notes and write some programs with TextFields. next week on Wednesday 16 Jan.
using GUI controls - Graphic User Interfaces. who check out early to go to the doctor or somewhere else. It uses an Array of Objects to store the list of data. Download this Java class and read the notes at the end. Discussed the homework reading sections 2.1-2.8 on this page. more sense after today's lecture. Continue - we will continue discussing these notes about PARALLEL ARRAYS. 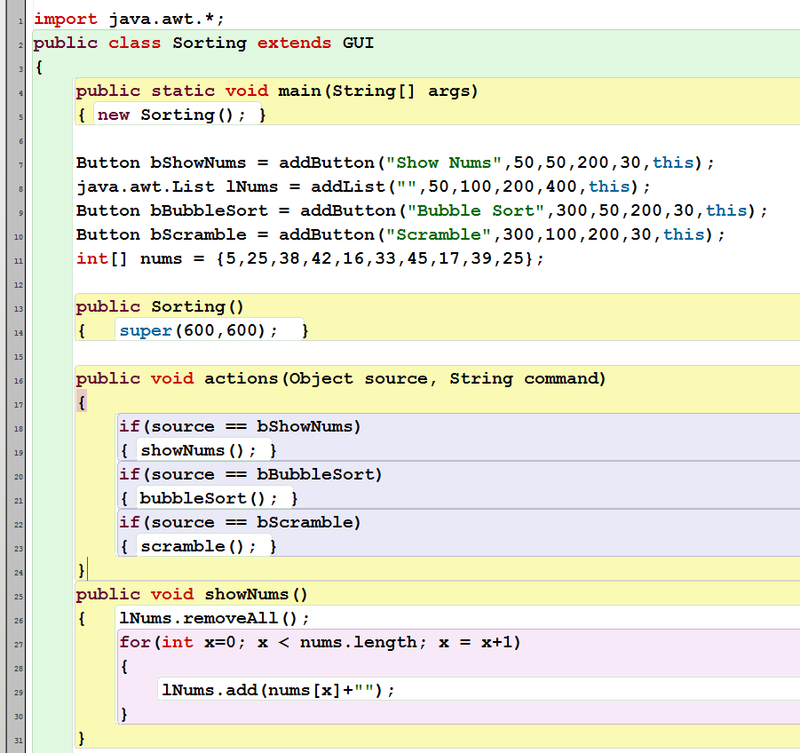 This is a web-site with clear and understandable notes about Java. It includes a clear introduction to OOP (Object Oriented Programming). Read sections 2.1-2.8 on this page. Compile and run the TestCircle program. execute the main method in the TestCircle class. From now on, we will use BlueJ from http://www.bluej.org . You can visit their site and download the editor. the Windows .msi file will be blocked by our network policy. Here are some notes for getting started with BlueJ. We will continue with these notes about PARALLEL ARRAYS. and BlueJ will help to make this easier to understand. out the NAMES of all the items that cost under 2.00 . Here is an almost complete solution to yesterday's assignment. programs containing loops and arrays. Do the problems in this document. How can we store a calendar in Java? How do board games work? How can we store Tic-Tac-Toe or Mine Sweeper or KINGS in Java? analyze the game and develop a winning STRATEGY. Work on this sample program using arrays. - use a loop to do this? If you finish early, you may start your homework. Download the program, run it, try typing in appointments. Observe any problems that occur. Bring questions to class on Monday. You do NOT need to do all the practice problems. We need to finish the ALARM function for the digital watch program. but does not stop there. It needs to be fixed. maybe using a LOOP to make quite long numbers. We will create a digital watch control program in PEP/8 assembly language. everyting in section 6.4 (p. 166-174). questions about compatibility between different platforms. Today - continue with the sample programs in these notes . about syntax and PARSING of code. (a) Run the program named Money Decisions. (b) Figure out the correct number of EUROS to make the program print "BINGO"
Does this stop the program from running? (d) Add another nonsense line in the middle of the program. Does that stop the program from running? (e) Do you think this programming language INTERPRETTED or COMPILED? 2. Visit this BASIC web-site: http://www.runbasic.com/ , then click on [Write Your Own]. (a) Copy this program into the editor and run it. print POUNDS ; " BP"
print "That is a lot of Yen"
(b) Find the LARGEST amount of EUROS that does NOT print "That is a lot of Yen". (c) Explain the purpose of the ; semicolon in this language. (d) Change one of the commands to introduce a SYNTAX ERROR. Run it and read the error message. (e) Is this language INTERPRETTED or COMPILED? (f) Is this language STRONGLY TYPED or WEAKLY TYPED? 3. Translate the program from #2 above into Java and make it run correctly. (a) Find an example program with a LOOP that is similar to FOR in Java. (b) Take one of your LOOP programs from last class (1 Nov) and translate it into PSEUDOCODE. (a) Find an example program with a FOR loop in it. (b) Translate one of your LOOP programs from last time into BASIC. You need to copy the entire folder to the D: drive or some other local storage. and check whether you get the same results. and returns the number of days in that month - assume February has 28 days. as outlined in the practice section. without simply typing a word into the program? - correct pw = "elephant"
How can a program do this? These pages contain some useful examples. a common embedded processor system, assigned last Monday. REMINDER - On Thursday, HL students will present a 5 minute explanation of their chosen topic (below). We will discuss more String methods today. We will have a 5 minute quiz on Thursday - about String methods. Try to do at least one of parts a,b,c. IB Syllabus 7.1.1 : Discuss a range of control systems. students should be able to analyze a specified system. We will write some sample control programs in Java. What input devices (sensors) must exist in the system? What output devices (actuators/transducers or motors) must exist? and then think about inputs and outputs. and answer the 4 questions, then present the answers to the class. words "for example" frequently during your presentation. Your presentation should last no more than 5 minutes. Due Date : You will present your answers on Thursday 18 Oct.
but these are the most important for programmers. We will be studying LOGICAL THINKING and the way that computers perform LOGICAL OPERATIONS. We will use Audacity and FrHed to look at some sound data. Here are some very brief notes about Audacity and .WAV file storage. "data-bending" techniques, and some other sound stuff. Today - Discuss the Java programs from Friday. Bring headphones to class tomorrow. We will have a written test on Monday 24 Sep.
experiments we studied in the past few weeks. finish as much as you can. Don't spend more than 40 minutes. when you come to class on Tuesday. Computers store numbers in memory locations, like boxes. We can use variable names to identify these memory locations. of ways to produce a variety of different values. Read these notes and do the exercises and answer the questions. Homework : Read "Binary Representations" at the end of section 3.1. Also read section 3.5 . Read these notes, do the exercises and answer the questions. especially limits caused by finite storage space. Resources for studying numbers and data representation in computers. Today : First experience with Java programming - Java calculations. you can download processing here. the same on Windows, Mac and Linux. We will discuss a few more ideas from chapter 1 today. Afterward, finish organizing the online shared vocabulary list. ask questions and employ any other useful resources. We will have a written test on Tuesday 28 Aug (pd 4). people during the test - neither electronically nor in-real-life. understood and may appear on the test. Explain what IPOcS means, as a description of a computer. Explain the meaning of SHOP as a description of a computer system. Explain why ABSTRACTION is important in computer systems. What is the purpose of a "punch card"? State one MODERN example of an "auxiliary storage device". Why did magnetic tapes replace card readers? What replaced "vacuum tubes" in the 2nd generation of computers? Outline one advantage of magnetic disks over magnetic tapes. Approximately when did CHIPS become popular as circuit components? Approximately when was the first PC marketed? What is the essential difference between a PC and a "workstation"? What is the main feature of "parallel computing architecture"
that makes it faster than more traditional architectures? According to this book, what is the "essential question" of Computer Science? Try to answer some of the questions at the end of the chapter. We will make a list of vocabulary from the Chapter 1 reading. Make ONE list containing ALL the words that you all highlighted. the ESSENTIAL ELEMENTS of that term. We will discuss the recent Mars Curiosity landing, as well as other robots. What makes a robot different from a computer? What are some current examples of successful uses of robots? What would we like robots to accomplish (please don't answer "everything")? What near-future developments are likely to turn some of our robot wishes into reality? We will discuss digital devices, history and future. Hopefully you have all done the reading assignment - chapter 1 from Computer Science Illuminated. Read Chapter 1 of Computer Science Illuminated (handout) again. Mark important vocabulary, especially words that you don't understand. We will collect a comprehensive list tomorrow. Make a list of things you should rather NOT do with a Smarthphone (inefficient or difficult). These are things for which the phone NOT EFFECTIVE. these should be tasks that a normal computer CAN do. For example, neither is useful for hammering nails. read chapter 1 in Computer Science Illuminated. What is Computer Science? Try watching this video. How is that connected to our IB Computer Science class?